How can you complete your appliqué projects in record time and still make them look like cherished heirlooms? EASY! Learn the secrets of using your machine, some new tools & a few wonderful techniques that will make the "A" word fun and addictive! Learn the secrets of preparing appliqué using fusibles, spray starch, non-woven fusible interfacing & freezer paper. How to make stems & a variety of techniques to make flower centers & circles is demonstrated with great close-ups & attention to all those little tips that make appliqué fun! This is a great place to learn more about your machine & its capabilities. Joanne guides you through perfecting your blanket & blind hem stitches to make your appliqué projects a pleasure to stitch! 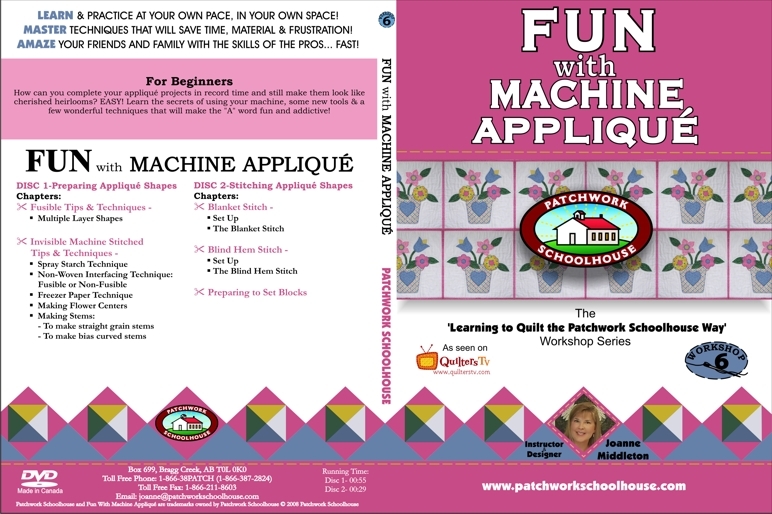 The Learning to Quilt the Patchwork Schoolhouse Way series is a set of seven workshops all designed with accurate technique in mind. The DVD format allows viewers to learn the most up-to-date methods of construction as well as improving the old standbys. These technique workshops have been taught for several years at many guilds & a local quilt shop with rave reviews! The DVDs have something for every skill level.